This is the second of many posts which give historical background for events in We Never Stood Alone. 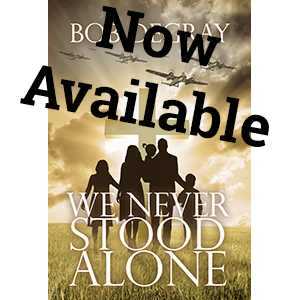 One of the characters in We Never Stood Alone is a conscientious objector. His story helps to show how believers respond to questions of conscience – both their own consciences and the consciences of others. It also reflects a small but interesting facet of World War 2 history. From its beginnings in World War 1, the number of conscientious objectors in the United Kingdom grew to 60,000 in World War 2, and their stories are diverse,fascinating and probably relevant to our day. 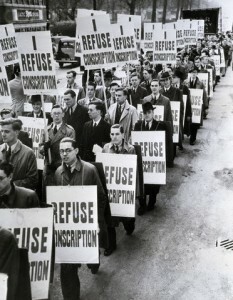 Around 16,000 men were recorded as conscientious objectors, with Quakers, traditionally pacifist, forming a large proportion: 4500 objectors were sent to do ‘work of national importance’ such as farming, 7000 were given non-combatant duties, however 6000 were forced into the army, and when they refused orders, they were sent to prison. . . . . Tribunals were notoriously harsh towards conscientious objectors, reflecting widespread public opinion that they were lazy, degenerate, ungrateful ‘shirkers’ seeking to benefit from the sacrifices of others. During World War 2 the number of British conscientious objectors, often called ‘CO’s’ or ‘conchies’ rose to 61,000. 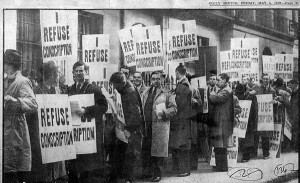 As in World War 1, each objector had to go before a Conscientious Objection Tribunal. This time around, however, the tribunals were a bit more fair and consistent, though rejection of applicants varied widely from tribunal to tribunal. According to an unsourced statement on the Spartacus Education site, the rate of applicant rejections ranged from 6 percent to 41 percent depending on the tribunal. Of the 61,000 who were registered, only 3,000 were given complete exemption and 18,000 were dismissed as false claimants. Of those directed to non-combatant military service almost 7,000 were allocated to the Non-Combatant Corps, re-activated in mid-1940; its companies worked in clothing and food stores, in transport, or any military project not requiring the handling of “material of an aggressive nature”. In November 1940 it was decided to allow troops in the NCC to volunteer for work in bomb disposal. In total over 350 volunteered. Other non-combatants worked in the Royal Army Medical Corps. Other acceptable occupations were farm work, mining, firefighting, and the Ambulance Service. I’ve been doing research on the Women’s Land Army in preparation for To Dare and Endure, the second novel in the Stokely Chronicle. It’s amazing to me how often the Land Girls served alongside conscientious objectors on the farms of Great Britain. Also alongside Italian prisoners, but that’s another story. 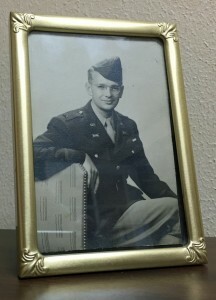 Ronald Smith’s story, told on the BBC People’s War website is fascinating and somewhat typical. He formed his objection to military service as a young and serious believer, though his Vicar tried to dissuade him. “I had to appear before Judge Wetherhead and his six helpers at a Tribunal in Bristol. I did not know that I had to have references from anyone, so they adjourned my case and I had to go a second time with my references. They recorded me as a C.O. and directed me into Agriculture, Land drainage work or Forestry.” Smith had eight or ten different jobs through the course of the war: first farm work, then forestry work, then farm work again. “We worked again with local labourers, Land Army girls and Italian Prisoners, quite a mixture, sometimes forty people working in one harvest field.” In these early years of the war, Smith was frequently accosted for his pacifist views, and on several occasions was physically beaten. After a long recovery from appendicitis, Smith ended the war working at a food processing facility in Wiltshire. This little-known aspect of World War 2 history is important to believers because we all have to wrestle with the teaching of Jesus and the whole testimony of Scripture. Will we, like Wellington Ward in We Never Stood Alone, conclude that loving your enemies can’t mean killing your enemies, or will we embrace the idea that there are times a nation can fight in a righteous cause? And if so, how will we respond if the nation tries to force us to fight in a cause we consider unrighteous? These questions are not only of historical interest in an age when terrorism has produced such a diverse and often unsatisfying set of responses from our own governments.